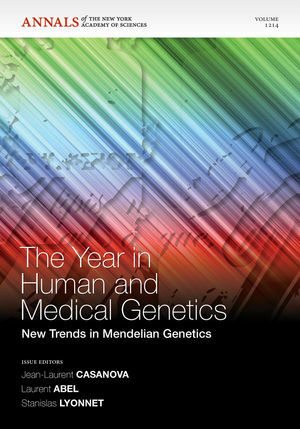 The latest edition of The Year in Human and Medical Genetics is focused on exploring new trends in Mendelian genetics. While Mendelian genetics is often seen as an out-dated discipline of interest to rare patients and few scholars, there have been many ground-breaking discoveries have been made in Mendelian genetics in the last decade. Single-gene defects of known Mendelian phenotypes have been deciphered, and novel diagnostic and therapeutic means have been devised, thanks to these studies. Moreover, novel phenotypes have been explored from a Mendelian angle, including common phenotypes. This volume captures the most important topics in Mendelian genetics through thought-provoking reviews that highlight the importance of classical Mendelian phenotypes and, when applicable, that challenge the "rare disease-rare variant/common disease-common variant" theme so common today. NOTE: Annals volumes are available for sale as individual books or as a journal. For information on institutional journal subscriptions, please visit: http://ordering.onlinelibrary.wiley.com/subs.asp?ref=1749-6632&doi=10.1111/(ISSN)1749-6632. Jean-Laurent Casanova is the editor of The Year in Human and Medical Genetics: New Trends in Mendelian Genetics, Volume 1214, published by Wiley. Laurent Abel is the editor of The Year in Human and Medical Genetics: New Trends in Mendelian Genetics, Volume 1214, published by Wiley.